After working together as line cooks for three years, Morgan and David finally made it official. Christmas Eve eventually became their "I love you" anniversary and David surprised Morgan with his proposal. While with his mom and sister, David asked Morgan to help him get presents out of his truck; he had their dog Kora come outside with a box in a stocking and Morgan knew he was about to pop the question! When they went back inside, his mom and sister had champagne waiting so they could celebrate. Morgan's favorite moment of the wedding was their special time together before the wedding madness started. They were led to chairs that sat back to back, where they held hands and read their love notes together. The long-awaited moment of marrying her soul mate finally felt real to Morgan, and she felt like they were the only two people in the room. Little details made their day come together, such as their dog-daughter Kora as a ring bearer; DIY touches such as cork and 3-colored twine for card and buffet label holders, hand painted wooden letters, antique table for the dessert bar, handmade chalkboards and flower girl baskets. Morgan and her father built the altar, which was a pergola with sunburst handrails, stained blue and decorated with ivory tulle and floral tufts. They also made heart-shaped platforms for the bridesmaids to stand on so their heels didn't sink in the grass! Morgan's brother and father walked her down the aisle. 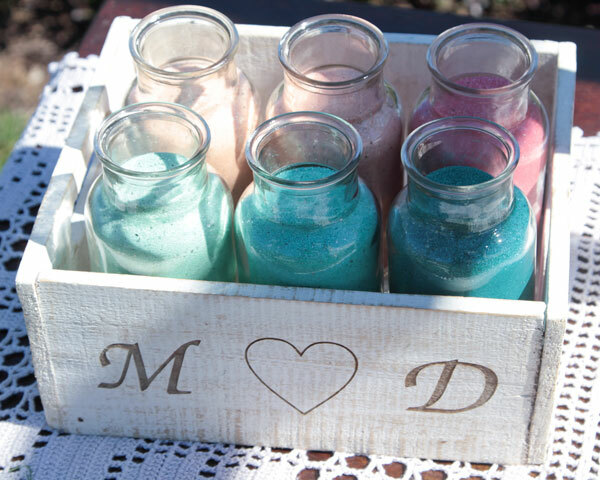 She and David had a unique ceremony with six different colors of sand and used a vintage milk bottle that they sealed with candle wax. Centerpieces were an assortment of vintage bottles and wildflowers and accompanied by three votive candles, 2 "I Spy" cards, disposable cameras, and info cards. Fun food was stationed around the reception area to promote mingling, with a chips and dip station, popcorn station, sliders, and more. The happy couple and their guests partied the night away, with David and Morgan visiting King's Dominion for a fun day together as they save up for a tropical honeymoon. Be sure to see the Housden wedding on page 86 of the second issue of bridebook, on newsstands now!